Chemokines direct migration of immune cells into sites of inflammation and infection. Chemokine receptors are seven-transmembrane domain proteins that, in contrast to other cytokine receptors, cannot be easily engineered as soluble chemokine inhibitors. Poxviruses encode several soluble cytokine receptors to evade immune surveillance, providing new strategies for immune modulation. Here we show that vaccinia virus and other orthopoxviruses (cowpox and camelpox) express a secreted 35-kDa chemokine binding protein (vCKBP) with no sequence similarity to known cellular chemokine receptors. The vCKBP binds CC, but not CXC or C, chemokines with high affinity (Kd = 0.1–15 nM for different CC chemokines), blocks the interaction of chemokines with cellular receptors, and inhibits chemokine-induced elevation of intracellular calcium levels and cell migration in vitro, thus representing a soluble inhibitor that binds and sequesters chemokines. The potential of vCKBP as a therapeutic agent in vivo was illustrated in a guinea pig skin model by the blockade of eotaxin-induced eosinophil infiltration, a feature of allergic inflammatory reactions. Furthermore, vCKBP may enable the rational design of antagonists to neutralize pathogens that use chemokine receptors to initiate infection, such as HIV or the malarial parasite. Acentral element in host immune surveillance is the migration of immune cells into areas of injury or infection during the inflammatory response. Chemokines are chemoattractant cytokines that regulate trafficking and effector functions of leukocytes, and thus play a key role in inflammation and host defense against pathogens (1, 2, 3, 4, 5). Chemokines are divided into at least three structural groups based on the number and arrangement of conserved cysteines: CC (β) chemokines such as RANTES, macrophage inflammatory protein-1α (MIP-1α),3 and eotaxin; CXC (α) chemokines such as IL-8 and growth-related oncogene (GRO)-α (alternatively known as melanoma growth stimulating activity); and the C chemokine lymphotactin. Chemokines exert their activity by interacting with seven-transmembrane domain receptors expressed in different cell subsets, thus determining the leukocyte subtype that predominates in different types of inflammation. Chemokines are thought to form a chemical gradient in an immobilized phase via electrostatic interactions with negatively charged proteoglycans, which may increase the specificity of chemokine action (6, 7). There is evidence that the binding site of chemokines for proteoglycans and specific chemokine receptors (CKRs) are distinct (8, 9). The activity of chemokines is tightly regulated to prevent excessive inflammation that can cause disease, and these molecules represent potential targets for therapeutic intervention in a wide range of diseases. The production of soluble versions of cytokine receptors containing only the extracellular binding domain represents a physiologic and therapeutic strategy to block the activity of some cytokines (10, 11). However, the seven-transmembrane domain structure of CKRs makes the construction of soluble, inhibitory CKRs difficult, and thus antagonists based on mutated chemokines, blocking peptides, or Abs are alternative inhibitors of the chemokines under evaluation (1, 3). Poxviruses, a family of complex DNA viruses (12), have evolved unique strategies for evasion of the host immune response (13, 14, 15, 16) and are the only virus family known to produce secreted versions of receptors for cytokines such as TNF, IL-1β, IFN-α/β, and IFN-γ. These poxvirus proteins bind cytokines with high affinity and block their activity by preventing interaction with receptors on the target cell. Inactivation of virus genes encoding these cytokine inhibitors has profound effects on viral pathogenesis. Poxvirus cytokine receptors were initially identified from sequence similarity to the extracellular binding domain of cellular cytokine receptors, but binding and functional analysis led to the identification of the IFN-α/βR encoded by vaccinia virus (VV), which has very limited similarity to known cellular counterparts (17, 18). Here we report that a soluble 35-kDa protein encoded by VV strain Lister has chemokine binding activity, and similar proteins are produced by 11 orthopoxviruses representing three species: VV, cowpox, and camelpox viruses. During the preparation of this manuscript, Graham et al. (19) reported that the T1/35-kDa family of poxvirus-secreted proteins binds CC and CXC chemokines and modulates the influx of inflammatory cells into virus-infected tissues. However, the mechanism by which the T1/35-kDa proteins modulate chemokine activity was not demonstrated. Here we show that the virus chemokine binding protein (vCKBP) binds CC chemokines with high affinity and inhibits their ability to induce signal transduction and cell migration in vitro. However, vCKBP does not bind or inhibit CXC or C chemokines. We demonstrate that the vCKBP inhibitory mechanism is the blockade of the interaction of chemokines with cellular receptors, thus representing the first soluble protein identified that sequesters chemokines and blocks their activity. Furthermore, the therapeutic application of this novel soluble chemokine inhibitor is illustrated in a guinea pig skin model by the ability of vCKBP to block eotaxin-induced eosinophil infiltration in vivo, a feature of allergic inflammatory reactions. The growth conditions of human U937 and TK−143B cells, and the sources of VV strains have been described previously (20). The Evans and Lister strains used in this study and a Lister virus lacking the gene encoding the 35-kDa protein (ListerΔ35K or V357) (21) were provided by A. H. Patel (Institute of Virology, Glasgow, U.K.). Radioiodinated recombinant human IFN-γ (90 μCi/μg) and RANTES, MIP-1α, IL-8, and GRO-α (2200 Ci/mmol) were obtained from DuPont-New England Nuclear (Boston, MA). Recombinant human [125I]MIP-1α (2000 Ci/mmol) used for determination of affinity constants was obtained from Amersham (Little Chalfont, U.K.). Recombinant human RANTES, MIP-1α, monocyte chemoattractant protein-1 (MCP-1), MCP-2, MCP-4, eotaxin, IL-8, GRO-α, 78-amino acid epithelial cell-derived neutrophil activator, IFN-γ-inducible protein-10, platelet factor 4, neutrophil-activating peptide-2 (NAP-2), stromal cell-derived factor-1α, and lymphotactin, mouse eotaxin, and rat RANTES and MIP-1α were purchased from PeproTech (Rocky Hill, NJ). 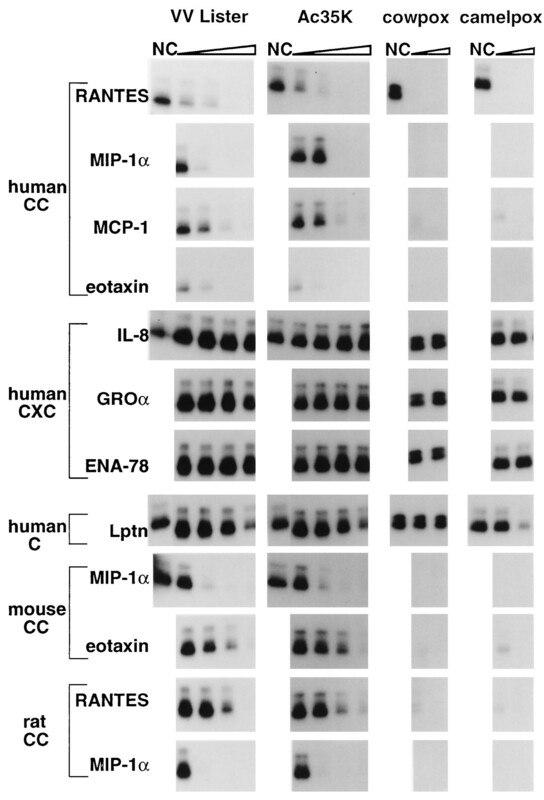 Recombinant mouse MIP-1α and human eotaxin, GRO-γ, and I309 were obtained from R&D Systems (Minneapolis, MN). Recombinant human IFN-γ was purchased from Genzyme (Cambridge, MA). Leukotriene B4 (LTB4) was purchased from Cascade Biochem Ltd (Reading, U.K.). The following were gifts: guinea pig eotaxin from Drs. G. Andrews and H. J. Showell (Pfizer Central Research, Groton, CT), human IL-5 from Dr. T. N. C. Wells (Glaxo-Wellcome Molecular, Geneva, Switzerland), and human C5a from Dr. J. Van Oostrum (Ciba Geigy, Summit, NJ). Heparin (6 kDa) and heparan sulfate from porcine or bovine intestinal mucosa, respectively, were purchased from Sigma Chemical Co. (St. Louis, MO). Rabbit antiserum to purified VV Lister 35-kDa protein, provided by A. H. Patel (Institute of Virology), or VV Western Reserve (WR) B15R protein expressed in baculovirus have been described previously (21, 22). Supernatants from orthopoxvirus-infected TK−143B cells or baculovirus-infected Sf cells were harvested 1 or 3 days postinfection, respectively, and prepared as previously described (22). Baculovirus supernatants were concentrated and dialyzed against PBS as described previously (18). VV supernatants were inactivated with 4,5′,8-trimethylpsoralen and UV light for cell migration assays (23). The binding medium was RPMI 1640 containing 20 mM HEPES (pH 7.4) and 0.1% BSA. Cross-linking experiments with 1-ethyl-3-(3-dimethylaminopropyl)-carbodiimide (EDC) or ethylene glycol-bis-succinamidyl succinate (EGS; 1 mg/ml) to 125I-labeled chemokines (0.4 nM) or [125I]IFN-γ (2 nM) were performed in a volume of 25 μl as previously described (20, 24). Samples were analyzed by SDS-PAGE in 16- or 20-cm-long gels with 12 or 14% acrylamide. In the competition assays with U937 cells, supernatants were preincubated with 100 pM [125I]chemokine in 100 μl for 1 h at 4°C. Subsequently, 2.5 × 106 U937 cells were added in 50 μl and incubated for 2 h at 4°C. Bound [125I]chemokine was determined by phthalate oil centrifugation as previously described (22). A scintillation proximity assay (Amersham) (25) was used for determination of the affinity constant. Purified 35K-Fc (200 pg) was incubated with [125I]MIP-1α, with or without unlabeled chemokines, in 100 μl for 2 h at room temperature. Protein A-fluoromicrospheres containing scintillant were added in 50 μl and incubated for 2 h, and bound [125I]MIP-1α was determined by scintillation proximity assay in a beta counter. Nonspecific binding, determined in the presence of a 1000-fold excess of unlabeled MIP-1α or as binding to 200 pg of purified B8R-Fc, was subtracted and represented 3.8 to 7.5% of the total counts per minute bound. Binding data were analyzed by the LIGAND program (26). The number of binding sites for MIP-1α per molecule of vCKBP was calculated from the number of binding sites deduced from the Scatchard analysis and from the concentration and m.w. of recombinant 35K-Fc. The 35-kDa gene was obtained by PCR using VV Lister DNA and oligonucleotides 5′-ATCGGTACCAATTATGAAACAATATATCGTCC-3′, which inserts a KpnI site, and 5′-GTTGGATCCTCAGACACACGCTTTGAGTTTTG-3′, containing a BamHI site. The 782-bp fragment was sequenced and cloned into pAcCL29-1 (27), generating pAc35K. The sequence contained His148 instead of Arg148 (21), but both sequences are natural variants of the VV Lister 35-kDa protein and bind chemokines with the same specificity. Recombinant 35-kDa protein containing a C-terminal six-histidine tag (35K.His) was produced in the baculovirus system. The 35-kDa gene was obtained by PCR using pCOS35K-Fc DNA (see Construction of 35K-Fc fusion and expression below) and oligonucleotides 5′-TCAGAATTCATTATGAAACAATATATCGTCC-3′, containing an EcoRI site, and 5′-ATCCTCGAGGACACACGCTTTGAGTTTTG-3′, containing an XhoI site. The 778-bp fragment was cloned into pBAC-1 (Novagen, Madison, WI), generating pAc35K.His. The sequence was confirmed and contained the Arg148 variant of the Lister 35-kDa protein. The recombinant baculoviruses Ac35K and Ac35K.His were produced from pAc35K and pAc35K.His, respectively, as described previously (20). The 35K.His protein was purified by metal chelate affinity chromatography (Ni-NTA resin; Qiagen, Inc., Chatsworth, CA). The recombinant baculoviruses AcB15R and AcB8R have been described (20, 22). The VV Lister 35-kDa gene fused to the Fc region of human IgG1 was constructed in pCOSFCLINK (a gift from Dr. P. R. Young, SmithKline Beecham Pharmaceuticals, King of Prussia, PA). The insert was obtained by PCR using VV Lister DNA and the oligonucleotides 5′-TCAGAATTCATTATGAAACAATATATCGTCC-3′, which introduces an EcoRI site, and 5′-ATCGGTACCGACACACGCTTTGAGTTTTG-3′, which inserts Gly and Thr via a KpnI site after amino acid 258 of the 35-kDa protein before the hinge region of human IgG1, which was provided by pCOSFCLINK, generating pCos35K-Fc. The sequence was confirmed and contained the Arg148 variant of the Lister 35-kDa protein. The 35K-Fc fusion protein was purified from supernatants of CHO cells stably transfected with pCOS35K-Fc on a protein A-Sepharose column (Pharmacia, Piscataway, NJ). The B8R-Fc fusion protein will be described elsewhere (J. A. Symons and G. L. Smith, unpublished). Changes in intracellular calcium flux were determined in purified human neutrophils and eosinophils as described previously (28). Briefly, granulocytes were separated from mononuclear leukocytes, RBCs, and platelets using a combination of dextran sedimentation and density centrifugation over Percoll-plasma gradients. For neutrophil experiments, granulocytes comprised >95% neutrophils, and the remaining cells were a mixture of eosinophils and mononuclear cells. For eosinophil experiments, blood was obtained from healthy atopic volunteers, and eosinophils were purified (>98%) from the isolated granulocytes by immunomagnetic separation using anti-human CD16 microbeads (Midimacs, Miltenyl Biotec, Teddington, U.K.) (29). Purified cells were loaded with fura-2/AM (neutrophils, 1 μM; eosinophils, 2.5 μM) and, after two washes, resuspended at 106 cells/ml in Ca2+/Mg2+-free PBS containing 10 mM HEPES (pH 7.4), 10 mM glucose, and 0.25% BSA. Aliquots of cells were taken, and the external calcium concentration was adjusted to 1 mM. Changes in fluorescence were monitored at 37°C using a spectrometer (LS50, Perkin-Elmer Corp., Norwalk, CT) at excitation wavelengths of 340 and 380 nm and an emission wavelength of 510 nm. Cell migration was evaluated in 10-mm tissue culture inserts (Life Technologies, Grand Island, NY) placed in 24-well plates. A 0.5-ml aliquot of test reagents diluted in RPMI 1640 with 1 mg/ml BSA was placed in the lower compartment, and 0.5 ml of U937 cell suspension (4 × 106 cells/ml) was placed in the upper chamber, separated by a polycarbonate filter (8-μm pore size). After incubation at 37°C for 2 h, the filter was washed, fixed, and stained with 4′6,-diamidino-2-phenylindole (DAPI) (30). The number of migrating cells in five high powered fields was counted using a fluorescence microscope. Accumulation of endogenous peripheral blood eosinophils. Sedated guinea pigs were pretreated for 1 h with human IL-5 (18 pmol/kg; i.v. injection) to induce blood eosinophilia (31). Guinea pig eotaxin, human C5a, or LTB4, with or without purified 35K.His protein, was then injected intradermally (50 μl/site) into individual sites in the shaved dorsal skin of the animals. After 2 h, the animals were killed, and the skin sites were excised (11 mm in diameter) for quantification of eosinophil accumulation by measurement of eosinophil peroxidase as previously described (31). Eosinophils were purified from the peritoneal cavity of horse serum-treated donor animals and radiolabeled with 111InCl3 as previously described (28). 111In-labeled eosinophils (5 × 106 cells/animal) were injected i.v. into recipient animals, and after 10 min, guinea pig eotaxin and human C5a, with or without purified 35K.His protein, were injected intradermally (100 μl/skin site; two sites per treatment) into individual sites in the shaved dorsal skin. After 2 h, the animals were killed, and the skin sites were excised (17 mm in diameter) for quantification of eosinophil accumulation by measurement of 111In counts using a gamma counter (28). Although no CKR homologues were found in the VV genome sequence (32), we searched for the expression of soluble chemokine binding proteins by orthopoxviruses. Binding assays with [125I]RANTES were performed with media from cultures infected with 13 strains of VV, rabbitpox, or buffalopox viruses (considered VV strains), cowpox virus (Brighton Red strain), elephantpox virus (considered a cowpox virus strain), or camelpox virus, followed by chemical cross-linking with EDC. A [125I]RANTES-vCKBP complex was observed with several viruses, including VV Evans (Fig. 1⇓c), but not with the best characterized VV strains WR and Copenhagen (Fig. 1⇓a). The size of the ligand-vCKBP complex ranged from 33 to 37 kDa, suggesting a vCKBP size of 25 to 29 kDa after subtraction of the 8-kDa monomeric RANTES. The variation in vCKBP size may reflect different polypeptide lengths or degrees of glycosylation among viruses. The different size predicted for vCKBP from orthopoxviruses by Graham et al. (19) in similar experiments (41 kDa) might be due to the use of higher resolution gels in this study. The soluble vCKBP was expressed before (early) and after (late) viral DNA synthesis by VV rabbitpox and United Soviet Socialists Republic (USSR) (Fig. 1⇓b). The RANTES-vCKBP complex was 37 to 44 kDa when the cross-linker EGS was used (Fig. 1⇓b), suggesting that two RANTES molecules could form a complex with vCKBP. Similar results were observed with [125I]MIP-1α, another CC chemokine (Fig. 1⇓c). MIP-1α can dimerize, but there is controversy about binding of CC chemokines as monomers or dimers to cellular CKRs (4). Cross-linking of media from all viruses shown in Figure 1⇓a to [125I]IL-8 (not shown) or [125I]GRO-α (Fig. 1⇓c and data not shown) was negative or very weak, suggesting vCKBP specificity for CC, but not CXC, chemokines. Soluble chemokine binding activity produced by orthopoxviruses. a, Media from cultures uninfected (mock) or infected with the indicated orthopoxviruses were incubated with [125I]RANTES and treated with the cross-linker EDC. b, Media from infected cultures were either harvested 24 h postinfection (L) or treated with the inhibitor of DNA synthesis cytosine arabinoside (40 μg/ml) and harvested 7 h postinfection (E). Media from cultures uninfected (mock) or infected were incubated with [125I]RANTES and cross-linked with EDC. c, Media from cultures uninfected (mock) or infected were incubated with the CC chemokines [125I]RANTES or [125I]MIP-1α or with the CXC chemokine [125I]GRO-α and treated with EDC or EGS. The amount of medium used was equivalent to 2 to 7 × 104 cells. An autoradiograph of the SDS-PAGE analysis, with molecular masses in kilodaltons, is shown. The positions of RANTES (R), MIP-1α (M), GRO-α (G), and ligand-receptor complexes (square brackets) are indicated. Although the predicted vCKBP size was 25 to 29 kDa, its expression profile in orthopoxviruses (Fig. 1⇑, a and c) correlated with the expression of a 35-kDa major secretory protein in VV Lister, Evans, and rabbitpox, but not in WR, Tian-Tan, or Wyeth (21, 33). The 35-kDa gene is present in cowpox (34), but is truncated by a frameshift mutation within the signal peptide in VV Copenhagen, where it is called B29R or C23L (32), and in VV WR, where it produces a 7.5-kDa protein (21, 35). The expression of vCKBP before (early) and after (late) viral DNA synthesis (Fig. 1⇑b) was also consistent with the transcriptional regulation of the 35-kDa gene from the strong early/late promoter p7.5, widely used in VV expression vectors (36). The absence of RANTES-binding activity in supernatants from cultures infected with a VV Lister mutant lacking the 35-kDa gene (ListerΔ35K) (21) indicated that the 35-kDa protein is the vCKBP encoded by VV Lister (Fig. 2⇓a). This was confirmed by showing specific binding of [125I]RANTES to the 35-kDa protein produced from recombinant baculovirus (Ac35K) and when fused to the Fc region of human IgG1 (35K-Fc), but not to the controls AcB15R (VV IL-1βR) (22), AcB8R (VV IFN-γR) (20), or B8R-Fc (VV IFN-γR fused to human IgG1; J. A. Symons and G. L. Smith, unpublished; Fig. 2⇓a). 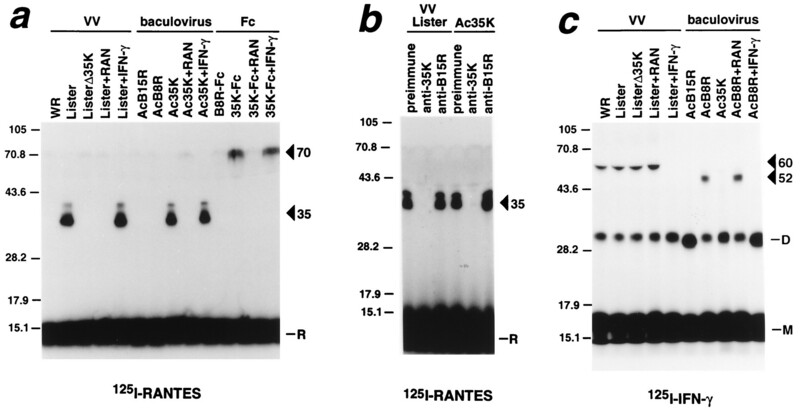 Additional evidence was the neutralization of the RANTES binding activity of VV Lister and Ac35K supernatants by antiserum against purified 35-kDa protein (21), but not by antiserum against the VV IL-1βR B15R (22) (Fig. 2⇓b). Identification of the VV Lister 35-kDa protein as the vCKBP. a, Cross-linking of [125I]RANTES with EDC to supernatants from cultures infected with the indicated VVs, recombinant baculoviruses, or 20 ng of purified Fc fusion proteins in the absence or the presence of a 1000-fold excess of RANTES (RAN) or IFN-γ. b, Cross-linking of [125I]RANTES with EDC to supernatants from cells infected with VV Lister or Ac35K in the presence of 5 μl of preimmune, anti-35K, or anti-B15R rabbit serum. c, Cross-linking of [125I]IFN-γ with EDC to supernatants from cultures infected with the indicated viruses. The amount of supernatant used was equivalent to 2 × 104 cells (VV) or 4 × 103 cells (baculovirus). An autoradiograph of the SDS-PAGE analysis, with molecular masses in kilodaltons, is shown. The positions of RANTES (R), IFN-γ monomers (M), IFN-γ dimers (D), and ligand-receptor complexes (triangles) are indicated. Recently, the myxoma virus-soluble IFN-γR (24), but not the VV IFN-γR (B8R) (20), was demonstrated to bind a wide range of chemokines by interaction with their proteoglycan binding domain (19, 37). Here we demonstrate that VV expresses a 35-kDa vCKBP that does not bind IFN-γ and is not B8R by showing that 1) the binding of [125I]RANTES to natural (VV Lister) or recombinant (Ac35K and 35K-Fc) 35-kDa protein was inhibited by unlabeled RANTES, but not IFN-γ (Fig. 2⇑a); 2) [125I]IFN-γ was cross-linked to the natural IFN-γR expressed from all three viruses, WR, Lister, and ListerΔ35K, or the recombinant IFN-γR (AcB8R), but not to the 35-kDa protein (Ac35K; Fig. 2⇑c); 3) the molecular sizes of monomeric IFN-γ complexed to IFN-γR were 60 and 52 kDa for the natural and recombinant IFN-γR, respectively (20), which were higher than the 35-kDa size of the RANTES-vCKBP complex and could not be explained by the size difference between IFN-γ (17 kDa) and RANTES (8 kDa; Fig. 2⇑, a and c); 4) the 35-kDa size of the RANTES-vCKBP complex was smaller than the 50-kDa size predicted for the RANTES-IFN-γR complex, as reported for the myxoma IFN-γR/M7T (37); and 5) the binding of [125I]IFN-γ to the natural (VV Lister) or recombinant (AcB8R) VV IFN-γR was inhibited by unlabeled IFN-γ but not by RANTES (Fig. 2⇑c). It is also demonstrated that VV IFN-γR does not bind RANTES by the inability of RANTES to bind rIFN-γR (AcB8R and B8R-Fc) (Fig. 2⇑a) and the lack of binding of RANTES to supernatants from cells infected with ListerΔ35K, which still express IFN-γRs (Fig. 2⇑, a and c). In addition, a higher molecular size of the soluble IFN-γR, known to be encoded by all the orthopoxviruses included in this study (20), complexed with [125I]RANTES, [125I]GRO-α, or [125I]IL-8 was not observed (Fig. 1⇑, a and c, and data not shown), indicating that the IFN-γR from other strains of VV, cowpox, or camelpox viruses does not bind CC or CXC chemokines. The binding specificity of vCKBP was further investigated in cross-linking experiments (Fig. 3⇓). The vCKBP expressed from recombinant baculovirus, VV Lister, cowpox virus, or camelpox virus bound human [125I]RANTES, and this binding was effectively competed in a dose-dependent manner by all human CC chemokines tested, including eotaxin, a specific chemoattractant of eosinophils. In contrast, human CXC chemokines or the C chemokine lymphotactin were not bound by vCKBP. The failure of high doses of GRO-α or IL-8 to block [125I]RANTES binding was consistent with the negative or very weak cross-linking of vCKBP from orthopoxviruses to [125I]GRO-α or [125I]IL-8 (Fig. 1⇑c and data not shown), suggesting a very low, and probably physiologically insignificant, affinity for CXC chemokines. The vCKBP also bound CC chemokines from mouse and rat. This vCKBP binding specificity was confirmed in experiments cross-linking [125I]MIP-1α to VV Lister supernatants in the presence of unlabeled chemokines (not shown). These results demonstrate that vCKBP from VV, cowpox, and camelpox viruses bind CC, but not CXC, chemokines. Binding specificity of vCKBP encoded by VV, cowpox virus, and camelpox virus. Cross-linking of 0.4 nM human [125I]RANTES with EDC to medium from infected cultures in the absence (NC) or the presence of increasing concentrations of unlabeled chemokines from different species. The amount of medium was equivalent to 1 × 104 cells for orthopoxviruses and 2 × 103 cells for Ac35K. The concentrations of unlabeled chemokines were 50-, 100-, 500-, or 2000-fold excesses for VV Lister and Ac35K, and 100- or 2000-fold excesses for cowpox and camelpox. An autoradiograph of the SDS-PAGE analysis showing the ligand-receptor complexes is presented. Lptn, lymphotactin. The affinity of vCKBP for CC chemokines was determined in studies of binding of purified recombinant 35K-Fc to [125I]MIP-1α, and quantification of bound MIP-1α was achieved using a scintillation proximity assay (25). The interaction of MIP-1α to 35K-Fc was saturable and of high affinity: in two experiments Kd values of 103 ± 4 pM (Fig. 4⇓a) and 128 ± 9 pM (not shown) were obtained. The high affinity interaction of vCKBP for CC chemokines (Kd = 115 pM) was similar or 100-fold higher than the affinity of chemokines for cellular CKRs (1, 4, 5). Scatchard analysis of the binding data predicted 4.2 binding sites for MIP-1α in the 35K-Fc protein in both experiments, suggesting 2.1 binding sites for chemokines in the 35-kDa protein. This was consistent with the binding of two chemokine molecules to vCKBP, as suggested by cross-linking studies (Fig. 1⇑c). The interaction of [125I]MIP-1α with 16.5 pM 35K-Fc was inhibited by a similar dose of purified recombinant 35-kDa protein, which was produced in baculovirus and containing a C-terminal six-histidine tag (35K.His), suggesting that both proteins bind MIP-1α with similar affinities (Fig. 4⇓b). Affinity constant of vCKBP binding to chemokines. a, Saturation curve and Scatchard analysis of [125I]MIP-1α binding to 35K-Fc. Purified 35K-Fc protein was incubated with the indicated doses of [125I]MIP-1α for 2 h, and the radioactivity bound was determined by scintillation proximity assay with protein A-fluoromicrospheres containing scintillant. The mean (±SEM) specific binding of triplicate samples is shown. b, Competitive inhibition with purified 35K.His. Purified 35K-Fc protein was incubated in triplicate with 50 pM [125I]MIP-1α in the presence of increasing doses of purified 35K.His produced in the baculovirus system. The percentage of specific binding (mean ± SEM) refers to binding in the absence of competitor, which was 4,235 cpm. c, Competitive inhibition with various doses of CC chemokines. Purified 35K-Fc protein was incubated in triplicate with 50 pM [125I]MIP-1α in the presence of increasing doses of unlabeled human CC chemokines. The percentage of specific binding (mean ± SEM) refers to binding in the absence of competitor, which was 4,049 or 4,561 cpm. The Kd values calculated from the data are indicated. d, Competitive inhibition with CC, CXC, and C chemokines. Purified 35K-Fc protein was incubated in triplicate with 50 pM [125I]MIP-1α in the presence of a 10,000-fold excess of unlabeled human (h), mouse (m), or rat (r) chemokines. The percentage of specific binding (mean ± SEM) refers to binding in the absence of competitor, which was 4,340 cpm. e, MIP-1α binding in the presence of glycosaminoglycans. Increasing doses of heparin or heparan sulfate were incubated in triplicate with 50 pM [125I]MIP-1α for 30 min before the addition of purified 35K-Fc protein. The percentage of specific binding (mean ± SEM) refers to binding in the absence of competitor, which was 3,014 cpm. Lptn, lymphotactin; ENA78, 78 amino acid epithelial cell-derived neutrophil activator; IP-10, IFN-γ inducible protein 10; PF-4, platelet factor 4; SDF-1α, stromal cell derived factor-1α. The affinity of vCKBP for other chemokines was determined in binding assays of 35K-Fc to [125I]MIP-1α in the presence of increasing doses of unlabeled chemokine competitors (Fig. 4⇑c). These data showed that vCKBP binds CC chemokines with different affinities: MIP-1α > eotaxin > RANTES > MCP-1 > I309. The lower affinity for I309 probably reflects the amino acid sequence of this chemokine being the most divergent of the CC chemokine group (4). Competition experiments with other chemokines corroborated, in a different quantitative binding assay, the specificity of vCKBP for CC, but not CXC or C, chemokines and extended these studies to 19 chemokines (Fig. 4⇑d). Chemokines interact with glucosaminoglycans such as heparin or heparan sulfate through their carboxyl terminus (6, 9). This interaction is thought to facilitate chemokine localization to the endothelial cells and does not interfere with chemokines binding to their receptors. To ascertain whether vCKBP bound to the proteoglycan binding site of chemokines, [125I]MIP-1α was preincubated with various doses of heparin or heparan sulfate before incubation with the 35K-Fc protein. Figure 4⇑e shows that heparin or heparan sulfate did not interfere with MIP-1α binding to vCKBP at doses up to 10 μg/ml and had a minor effect at higher doses up to 200 μg/ml, equivalent to a 6 × 105-fold molar excess of heparin over MIP-1α. Biologic activity of vCKBP for CC chemokines was shown by the ability of supernatants from orthopoxviruses and recombinant baculovirus Ac35K to inhibit the binding of radioiodinated RANTES and MIP-1α, but not GRO-α, to cellular receptors (Fig. 5⇓a). This again demonstrated the specificity of vCKBP for CC chemokines. As previously reported (38, 39), excess unlabeled RANTES failed to block the binding of [125I]RANTES to cells (Fig. 5⇓a). The binding of [125I]MIP-1α, but not [125I]GRO-α, to U937 cells was inhibited in a dose-dependent manner by supernatants containing the 35-kDa protein (Fig. 5⇓b). The potent inhibitory activity of vCKBP was illustrated by the complete blockade of MIP-1α binding to cells in the presence of 0.1 to 1 μl of medium, equivalent to the amount of vCKBP synthesized by only 200 to 2000 cells. Furthermore, 10 or 50 pM purified recombinant 35K.His protein produced in baculovirus blocked the binding of 100 pM [125I]MIP-1α to U937 cells by 50 and 95%, respectively (Fig. 5⇓c). These results showed that the soluble vCKBP blocks the binding of CC chemokines to their cellular receptors and were consistent with the high affinity interaction of MIP-1α and other CC chemokines with recombinant 35K-Fc. Inhibition of chemokine binding activity by vCKBP. 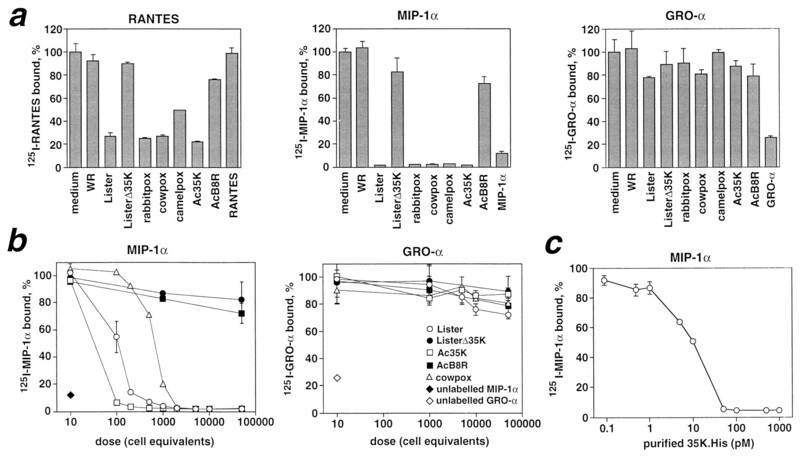 a, Binding of 100 pM [125I]RANTES, [125I]MIP-1α, or [125I]GRO-α to U937 cells in the presence of supernatants from 5 × 104 infected cells or a 100-fold excess of unlabeled chemokine. The mean ± SEM from duplicate samples are expressed as the percentage of counts bound in the presence of competitor compared with that bound without competitor (6,601, 10,620, and 2,351 cpm for RANTES, MIP-1α, and GRO-α, respectively). b, Binding of [125I]MIP-1α or [125I]GRO-α to U937 cells in the presence of different amounts of culture supernatants or a 100-fold excess of unlabeled MIP-1α or GRO-α. The mean ± SEM from duplicate samples and total counts per minute bound to cells are expressed as described in a. c, Binding of [125I]MIP-1α to U937 cells in the presence of different amounts of purified 35K.His. The mean ± SEM from duplicate samples is expressed as described in a. The total radioactivity bound was 4,518 cpm. The blockade of CC chemokine binding to cell receptors suggested that vCKBP would inhibit their biologic activity. This was demonstrated by the ability of vCKBP to inhibit the rapid and transient increase in intracellular calcium in eosinophils by the CC chemokines MCP-4 and eotaxin (Fig. 6⇓a). This inhibitory effect was selective for these agonists, since vCKBP had no effect on the calcium response induced by C5a in eosinophils (not shown). In contrast, vCKBP had no effect on the elevation of intracellular calcium levels in human neutrophils in response to the CXC chemokines IL-8, GRO-α, and NAP-2 (Fig. 6⇓b). This demonstrated specificity of vCKBP for CC, but not CXC, chemokines in a biologic assay. Blockade of chemokine biologic activity by vCKBP in vitro. a, Elevation of intracellular calcium levels in human eosinophils by CC chemokines. MCP-4 or eotaxin was preincubated with the indicated doses of purified 35K.His or control supernatant for 5 min before its addition to human eosinophils and measurement of calcium mobilization. The maximum elevation of intracellular calcium (mean ± SEM) in three experiments with eosinophils from different donors is shown. Representative traces from one experiment are represented in the insets. b, Elevation of intracellular calcium levels in human neutrophils by CXC chemokines. IL-8, GRO-α, or NAP-2 was preincubated with purified 35K.His or control supernatant for 5 min before its addition to human neutrophils and measurement of calcium mobilization. The maximum elevation of intracellular calcium (mean ± SEM) in four experiments with neutrophils from different donors is shown. c, Chemotactic activity of MIP-1α on U937 cells. The mean (±SEM) number of migrated cells per field under high power magnification (n = 5) in the presence of MIP-1α (50 ng/ml), with or without competitor, or 10−7 M FMLP (line) is shown. The vCKBP from VV Lister or recombinant baculovirus Ac35K also blocked the migration of U937 cells in vitro in response to the CC chemokine MIP-1α (Fig. 6⇑c). In contrast, ListerΔ35K and AcB8R supernatants did not. 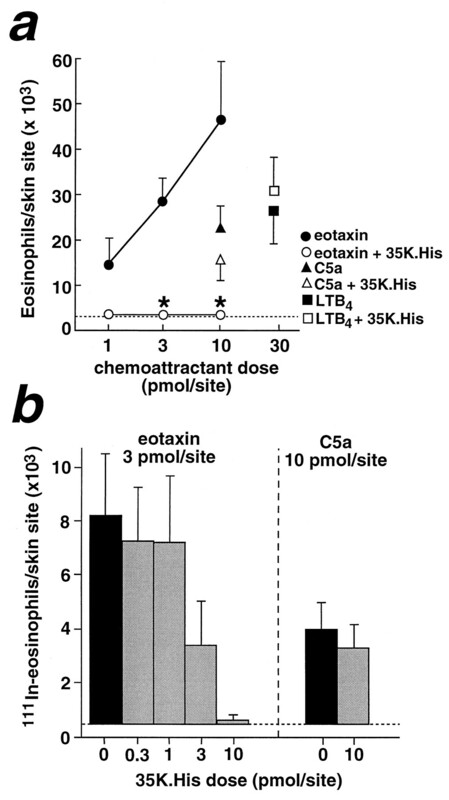 The blockade of chemokine activity by vCKBP was demonstrated in vivo in a guinea pig skin model of eotaxin-induced eosinophil infiltration (31). Purified recombinant 35K.His bound guinea pig eotaxin, as determined by cross-linking assay (not shown). The vCKBP inhibited local eosinophil infiltration induced by intradermal injection of eotaxin, but not other agents, in a guinea pig model using eosinophil peroxidase as an index of eosinophil numbers (Fig. 7⇓a). The inhibitory effect of various doses of vCKBP on eosinophil accumulation in the skin in response to eotaxin was determined in guinea pigs injected i.v. with 111In-labeled eosinophils (Fig. 7⇓b). The potency of this inhibitor in vivo was illustrated by the complete blockade of eotaxin activity by a threefold molar excess of vCKBP and 50% inhibition by an equal molar concentration (Fig. 7⇓, a and b). This emphasizes the potential therapeutic application of vCKBP in inflammatory diseases. Inhibition of eotaxin-induced eosinophil accumulation in guinea pig skin by vCKBP. a, Guinea pigs were pretreated for 1 h with human IL-5 to induce blood eosinophilia. Guinea pig eotaxin, human C5a, or LTB4 was injected intradermally in the presence of purified 35K.His (30 pmol/skin site) or control medium, and eosinophil accumulation was determined after 2 h. Results represent the number of eosinophils per skin site ± SEM from four or five animals. A statistically significant difference between groups that did or did not receive purified vCKBP is indicated by an asterisk (p<0.02). The detection limit of the assay is indicated with a dashed line. No eosinophil accumulation was detected in response to the injection vehicle (HBSS containing 0.1% low endotoxin BSA), purified 35K.His, or control medium alone. b, 111In-labeled eosinophils were injected i.v. into guinea pigs, and after 10 min, guinea pig eotaxin or human C5a, with or without 35K.His, was injected intradermally into individual sites. Accumulation of 111In-labeled eosinophils was determined after 2 h. Results represent the mean ± SEM from four animals. Eosinophil accumulation in response to the injection vehicle is indicated with a dashed line and was similar to that obtained with purified 35K.His or control medium alone. In this study we have identified and characterized a soluble vCKBP from poxviruses. We demonstrate that vCKBP is the VV Lister 35-kDa secreted protein, and similar proteins are expressed by other orthopoxviruses. This protein is encoded by gene B29R or C23L in the VV strain Copenhagen (32), where it is truncated and inactive, and is transcribed from the strong, early-late promoter p7.5, frequently used in VV expression vectors (36). In contrast to known cellular CKRs, which are hydrophobic proteins with seven transmembrane domains, the 35-kDa protein is a cysteine-rich, acidic (pI 4.2), soluble protein with no sequence similarity to cellular counterparts. Many of the poxvirus-encoded cytokine receptors mimic the extracellular binding domain of known cellular counterparts; thus, vCKBP may represent a viral version of an unidentified cellular molecule, as has been proposed for the VV IFN-α/βR (18). 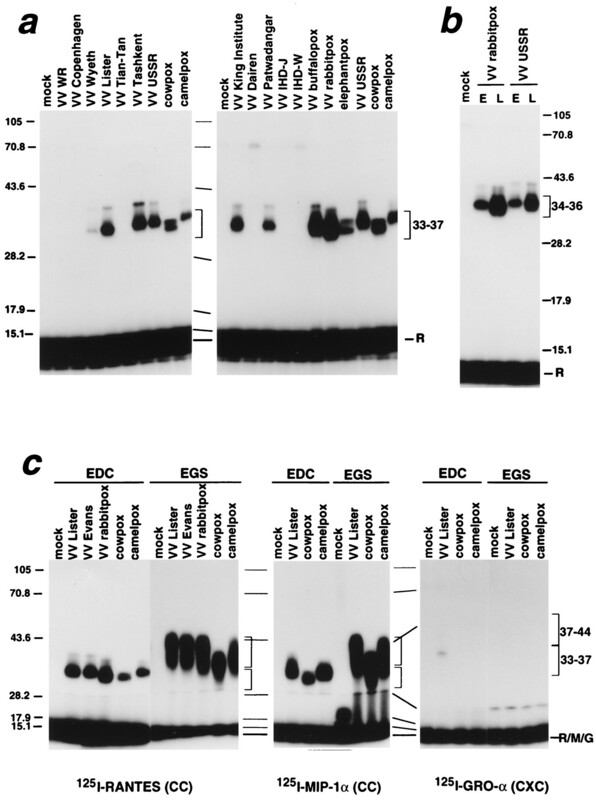 Chemokine binding proteins closely related to the VV Lister 35-kDa protein are found in other VV strains, the leporipoxviruses Shope fibroma virus (S-T1) and myxoma virus (M-T1), racoonpox virus, cowpox virus, and camelpox virus (Ref. 19 and this report), and are predicted to be produced by strains of variola virus, the cause of smallpox (G3R) (40, 41). Interestingly, VV WR gene A41L is predicted to encode a secretory protein more distantly related to the VV Lister 35-kDa protein (33, 42) and may represent another vCKBP that binds chemokines not included in this study. Concerning the specificity of vCKBP for different chemokines, we demonstrate unequivocally that it is a specific inhibitor of CC, but not CXC or C, chemokines. This is shown by cross-linking experiments with cold competitors, in more quantitative binding experiments, and by determination of affinity constants in studies in which 19 chemokines were analyzed. Most importantly, the CC specificity was confirmed in biologic assays showing that vCKBP does not block the interaction of CXC to cellular receptors or their capacity to transduce signals. This contradicts the conclusion of Graham et al. (19), who reported that it had a broad specificity for CC and CXC chemokines. However, consistent with our results, these researchers found that excess IL-8 could not compete the cross-linking of RANTES to vCKBP, but the effect on the biologic activity of CXC chemokines was not investigated. The mechanism by which vCKBP inhibits chemokine activity might be its interaction with the proteoglycan binding domain of chemokines, which is thought to facilitate chemokine localization to endothelial cells, as suggested by Graham et al. (19). Alternatively, vCKBP might interact with the receptor binding domain of chemokines and thus block binding to cellular receptors, as reported for poxvirus soluble receptors (13, 14). The data in this paper show that vCKBP blocks CC chemokine activity by binding chemokines with high affinity, at a site different from the proteoglycan binding domain, and preventing their interaction with cellular receptors. Consistent with this, the affinity of vCKBP for human MIP-1α (Kd = 115 pM) is similar or 10- to 100-fold higher than the affinity of most chemokines for cellular CKRs, which normally ranges from 1 to 10 nM (1, 4, 5). The vCKBP also binds eotaxin, RANTES, and MCP-1 with high affinity (Kd = 1–15 nM). 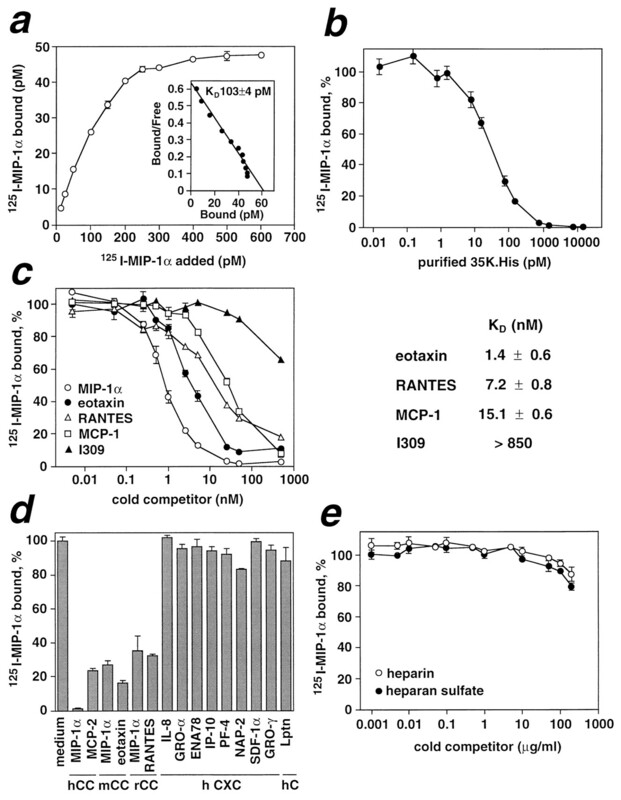 The lower affinity of RANTES for myxoma M-T1 protein reported by Graham et al. (19) (Kd = 73 nM) might be due to the use of human chemokines with the M-T1 protein from myxoma virus, whose natural host is the rabbit. There is precedent for myxoma virus-soluble cytokine receptors binding human cytokines with much lower affinity than rabbit cytokines (43, 44). Evidence for the binding of vCKBP to two chemokine molecules was found in cross-linking experiments using EGS and in Scatchard analysis of the binding of MIP-1α to 35K-Fc. MIP-1α and IL-8 can dimerize, but there is controversy about binding to cellular CKRs and the biologic activity of chemokines as monomers or dimers (4). If vCKBP does bind to dimeric chemokines, this might enhance the inhibitory activity of vCKBP. Poxviruses have evolved two different mechanisms to block chemokine activity. First, the soluble IFN-γR from myxoma virus (M-T7), but not VV strain WR, binds the heparin-binding domain of a wide range of chemokines (19, 37), and this additional function of M-T7 is consistent with an increased leukocyte infiltration to sites of myxoma virus replication in rabbits infected with a deletion mutant lacking this protein (45). The myxoma M-T7 protein may prevent the correct localization of chemokines in vivo, which form a gradient by interacting with proteoglycans at the surface of endothelial cells. We show here that the soluble IFN-γR from 19 orthopoxviruses (20), including strains of VV, cowpox, and camelpox viruses, does not bind CC or CXC chemokines. Second, we show that orthopoxviruses encode a vCKBP that binds chemokines with high affinity at a site different from the proteoglycan binding domain and blocks their interaction with cellular CKRs. The expression of a potent, soluble, CC-specific vCKBP by poxviruses suggests an important role for CC chemokines in anti-viral defense. Nonetheless, deletion of the 35-kDa protein in VV rabbitpox did not greatly affect the outcome of infection in mice and rabbits (33). Graham et al. (19) now report an increased leukocyte influx in the skin of rabbits infected with VV rabbitpox mutant lacking the 35-kDa gene, compared with wild-type VV rabbitpox. However, construction of a revertant virus in which the 35-kDa gene is reintroduced into the VV rabbitpox mutant genome is required to support this conclusion. This VV rabbitpox mutant was constructed by transfecting DNA from VV Lister into VV rabbitpox-infected cells (33), and other mutations might have been introduced in the regions flanking the 35-kDa gene, which includes a gene encoding a TNFR homologue (32). Additional studies with this or alternative models of poxvirus infection are required to fully understand the role of vCKBP in poxvirus pathogenesis. The important role of chemokines and CKRs in the pathogenesis of virus infections is emphasized by the expression of 1) chemokine-like proteins by molluscum contagiosum virus (46), Kaposi’s sarcoma-associated herpes virus (47, 48), and murine CMV (49), representing potential alternative ways to modulate chemokine activity; and 2) seven-transmembrane domain CKRs by large DNA viruses such as herpesviruses and poxviruses (14). Moreover, the MIP-1α knockout mouse is less able to clear influenza virus infection (50), and RANTES, MIP-1α, and MIP-1β increase resistance to HIV infection (2, 3). Poxvirus proteins that counteract the immune system have been optimized during the evolution of viruses with their hosts; are providing insights into the physiologic role of immune regulatory molecules such as cytokines (51) or chemokines; and represent potential sources of immunomodulatory proteins and new strategies of immune modulation. In this report a novel soluble chemokine inhibitor from poxviruses with therapeutic potential is described. Eosinophil accumulation in response to eotaxin is a feature of allergic inflammatory reactions, such as those occurring in allergic asthma. The potent eotaxin inhibitory effect of vCKBP in vivo emphasizes its potential therapeutic application in inflammatory diseases. The vCKBP has binding specificity for CC chemokines, but the soluble inhibitor or variants from other poxviruses may provide the structural scaffolding needed to design specific soluble inhibitors of other chemokines. The finding of a soluble vCKBP also has implications for infectious agents such as HIV, in which CKRs play an important role in determining transmission and disease progression (2, 3). Inhibition of the interaction of the HIV envelope with the chemokine binding domain of CKRs has recently emerged as a new target for intervention. The vCKBP might be engineered to create soluble molecules that bind to the domain of gp120, which interacts with the CKR to block HIV infection at an early stage (2, 3). A similar approach might yield therapeutic agents to block attachment of the malarial parasite to the Duffy Ag on erythrocytes and initiation of the infection (52). The poxvirus chemokine inhibitor reported here represents a new and exciting virus immune evasion mechanism that provides insights into virus pathogenesis, the function of key immune regulatory molecules, and new strategies for therapeutic intervention in immune responses and disease. We thank A. H. Patel (Institute of Virology, Glasgow, U.K.) for the VV Lister lacking the 35-kDa protein and Abs against this protein. ↵1 This work was supported by grants from The Wellcome Trust, the Royal Society, and the National Asthma Campaign. ↵2 Address correspondence and reprint requests to Prof. Geoffrey L. Smith, Sir William Dunn School of Pathology, University of Oxford, South Parks Rd., Oxford, United Kingdom OX1 3RE. ↵3 Abbreviations used in this paper: MIP-1α, macrophage inflammatory protein-1α; GRO-α, growth-related oncogene α; CKR, chemokine receptor; VV, vaccinia virus; vCKBP, virus chemokine binding protein; MCP, monocyte chemoattractant protein; NAP-2, neutrophil activating peptide-2; LTB4, leukotriene B4; WR, Western Reserve; EDC, 1-ethyl-3-(3-dimethylaminopropyl)-carbodiimide; EGS, ethylene glycol-bis-succinamidyl succinate. Moss, B.. 1996. Poxviridae: the viruses and their replication. B. N. Fields, and D. M. Knipe, and P. M. Howley, and R. M. Chanock, and J. Melnick, and T. P. Monath, and B. Roizman, and S. E. Straus, eds. In Virology Vol. 2: 2637 Lippincott-Raven, Philadelphia. Smith, G. L.. 1993. Expression of genes by vaccinia virus vectors. A. J. Davison, and R. Elliot, eds. Molecular Virology: A Practical Approach 257 Oxford University Press, Oxford.